NCRA’s A to Z Intro to Machine Shorthand program, introduced last year, is steadily gaining interest by the public and the media. In addition to programs in more than 16 states, most recently media outlets in New York and Wisconsin highlighted the effort. Good Morning Rochester, Rochester, N.Y., aired a piece on Sept. 19 that featured NCRA Director Meredith A. Bonn, RPR, an official court reporter from Webster. The story highlighted what Bonn does as well as emphasized the current need for court reporters and captioners. A second story that also featured Bonn provided insight into what it takes to enter the profession and included information about the A to Z programs she leads in her area. NCRA Past President Nancy Varallo, FAPR, RDR, CRR, Worcester, Mass., developed the A to Z program to help those outside the profession experience steno by learning to write the basics. She graciously turned the program over to NCRA. Since then, NCRA’s Education Department has successfully worked at the grassroots level to promote the effort. The six-to-eight week course is available at no cost to participants. Volunteer leaders host the sessions, and participants use loaner machines that have been donated by others in the profession. To learn more about the A to Z Intro to Machine Steno program, visit TheJCR.com/tag/a-to-z-program, or contact Cynthia Bruce Andrews at candrews@ncra.org. 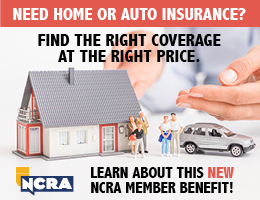 Subscribe to weekly news from NCRA! ﻿Ask the techie: What are the benefits of using multiple monitors for court reporters?